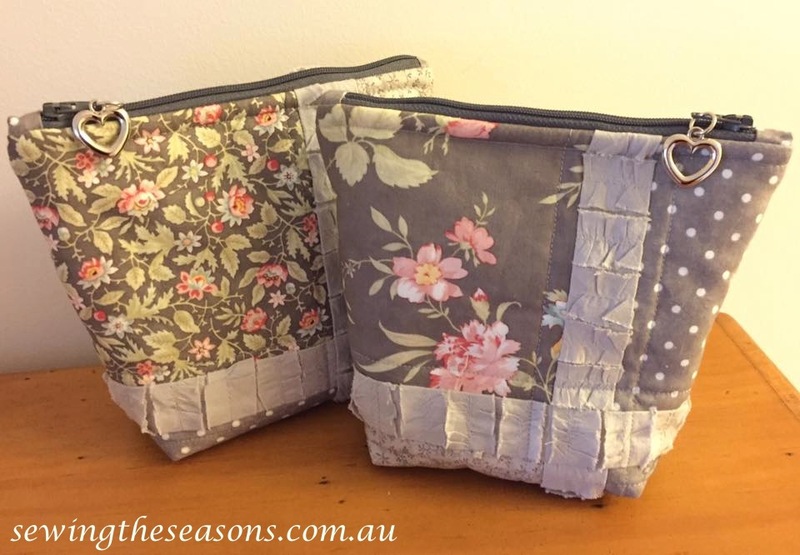 As several people have asked how I made these pouches, I decided to share a tutorial for anyone interested - always happy to share ideas or designs. One framed 9 patch square will make two pouches. All seams 1/4" unless otherwise stated. Lay out the 9 charm squares in a pleasing pattern (note for instruction pouch I was using sample fabrics with only a few colours from a range). Chain piece the shorter strips to the 9 squares then press. Add the longer strips between the rows then press. Trim the squares, cut iron interfacing to size & attach, then quilt as desired. Zipper - cut off end of zip, sew tab pieces right sides facing zip the fold back, press and trim. Attach zip to top of pouch - lay zip face down on right side of fabric and sew (you can use a zipper foot if desired, I find my normal foot works well). 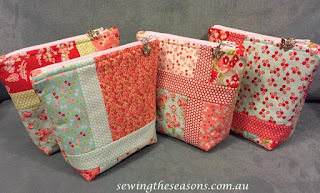 Note - You can play with which edge of the square you have at the top of the pouch = I choose to lay each side so the frame pieces don't meet on the side or base seams. Lay lining right sides to other side of zip - you are encasing the zip here between the lining and outer fabric. Stitch along each edge. Turn & press. Pin pouch right sides together - outer fabric to outer fabric, lining to lining - ensure you have zip tab folded down towards lining side. Stitch side seams. Stitch across base of outer pouch. 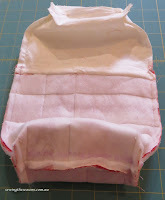 Stitch across base of lining - leave approximately 2 - 3" for turn through. Cut box corners = cut out 1" corners, measuring from seamlines, not edge of pouch. Finish gap where you turned through either by hand using a ladder stitch or on machine close to fold. Stand back and admire your pouch. I would love to see any photos of pouches others make.